England striker Harry Kane scored twice as Tottenham kept up the chase at the top with an easy win at Norwich. Dele Alli tapped in inside the first two minutes after Christian Eriksen's low shot had been blocked. Kane then stroked in the second from the spot after Alli, who came off with an illness at half-time, was fouled in trying to follow up Kane's saved shot. He then fired his second of the night from 15 yards after Eriksen had dispossessed Martin Olsson. The victory lifts Spurs up to third, above Arsenal on goal difference. Norwich could find themselves in the bottom three on Wednesday if Newcastle defeat Everton. Keegan-Toshack, Cole-Beardsley, Shearer-Sheringham - Kane and Alli just seem to have an understanding that some of the game's legendary link-ups possessed. The wholesome twosome have formed a formidable attack at Spurs. Alli has had a hand in 10 goals in his last 13 Premier League games for Spurs, and Kane has scored eight in his last eight. They are a fantasy football player's dream combo. Kane was his usual hungry self - snapping at the heels of the last defender. He should have got his reward for his doggedness when late in the game he stole the ball from Youssouf Mulumbu, surged towards goal but saw his shot rebound off the post. However, with seconds remaining he did grab his second when he pounced on the loose ball after good work from Eriksen and fired past Declan Rudd. As for Alli, he only played a cameo today, but it was a memorable one. The 19-year-old is both a threat outside the area and inside, as proved today. He anticipated brilliantly for the first, and repeated the trick when he won the penalty, which was conceded by Sebastian Bassong. Spurs manager Mauricio Pochettino said he was brought off at half-time because he felt unwell. Spurs fans will be praying he is fit for Saturday's home clash against Watford. The Canaries were the most active team in the transfer window, but have they made the right purchases? One of their buys was Portuguese right-back Ivo Pinto. He made his debut in the 5-4 defeat against Liverpool, and followed that up with a truly awful first-half display against Spurs. He allowed Christian Eriksen far too much space down that flank and was then put into a spin by Kane, who forced a good save from the impressive Declan Rudd. At the other end, there was little bite. Tall forward Dieumerci Mbokani looked the most potent, and had his side's best chance - a low drive that keeper Hugo Lloris was equal to. Another new signing Steven Naismith had a relatively quiet game, but perhaps the Scot, his team-mates and manager Alex Neil will have been slightly aggrieved that a penalty was not awarded when he fell under the challenge of defender Kevin Wimmer. Norwich manager Alex Neil: "Once you concede in the first minute and a half, we make it difficult for ourselves. "The Spurs penalty is the softest penalty I've seen all season. We didn't get the fair share of the decisions and that cost us. "If it was a clear penalty, I'd be the first to hold my hands up. The next game becomes huge for us now." Tottenham coach Mauricio Pochettino: "The performance was very good. I'm happy with three points. The first half was fantastic. "Dele felt unwell, but he's OK now. "Harry is still very young and has big potential to improve." Alli has scored in consecutive games for the first time since April 2015 (in all comps), when he netted for MK Dons against Fleetwood and then Leyton Orient. Alli's goal was the fourth quickest in the Premier League this season (1:36) and Tottenham's quickest in the Premier League since Boxing Day 2014 (Kane v Leicester, 0:57). Tottenham have gone 11 games unbeaten away from home in the league for the first time since a run of 16 in 1985. Norwich City failed to score at home in the league for the only the second time in their last 12 fixtures at Carrow Road. Norwich face what you can call a relegation six-pointer against Villa at home on Saturday. Spurs are at home to Watford on the same day. 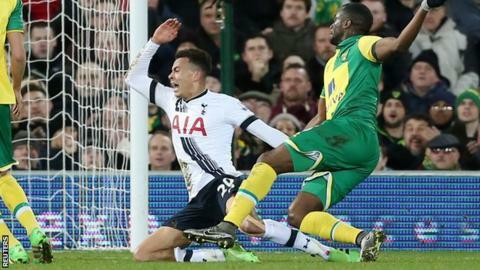 Match ends, Norwich City 0, Tottenham Hotspur 3. Second Half ends, Norwich City 0, Tottenham Hotspur 3. Corner, Norwich City. Conceded by Kyle Walker. Substitution, Tottenham Hotspur. Erik Lamela replaces Christian Eriksen. Goal! Norwich City 0, Tottenham Hotspur 3. Harry Kane (Tottenham Hotspur) left footed shot from the centre of the box to the bottom left corner. Assisted by Christian Eriksen. Kyle Walker (Tottenham Hotspur) wins a free kick in the attacking half. Danny Rose (Tottenham Hotspur) is shown the yellow card. Jonny Howson (Norwich City) wins a free kick on the right wing. Attempt missed. Youssouf Mulumbu (Norwich City) right footed shot from outside the box is too high. Assisted by Vadis Odjidja-Ofoe. Danny Rose (Tottenham Hotspur) wins a free kick on the right wing. Foul by Vadis Odjidja-Ofoe (Norwich City). Corner, Tottenham Hotspur. Conceded by Sebastien Bassong. Harry Kane (Tottenham Hotspur) hits the left post with a right footed shot from the right side of the box. Substitution, Norwich City. Vadis Odjidja-Ofoe replaces Steven Naismith. Foul by Dieumerci Mbokani (Norwich City). Attempt blocked. Youssouf Mulumbu (Norwich City) header from the centre of the box is blocked. Assisted by Sebastien Bassong with a headed pass. Corner, Norwich City. Conceded by Mousa Dembélé. Substitution, Norwich City. Cameron Jerome replaces Matthew Jarvis. Substitution, Tottenham Hotspur. Tom Carroll replaces Son Heung-Min. Attempt blocked. Jonny Howson (Norwich City) left footed shot from the right side of the box is blocked. Assisted by Ivo Pinto. Attempt missed. Steven Naismith (Norwich City) right footed shot from outside the box misses to the left. Assisted by Dieumerci Mbokani with a headed pass. Corner, Tottenham Hotspur. Conceded by Ivo Pinto. Steven Naismith (Norwich City) wins a free kick on the left wing. Corner, Tottenham Hotspur. Conceded by Martin Olsson. Offside, Norwich City. Steven Naismith tries a through ball, but Dieumerci Mbokani is caught offside. Offside, Norwich City. Steven Naismith tries a through ball, but Sebastien Bassong is caught offside. Attempt blocked. Steven Naismith (Norwich City) left footed shot from very close range is blocked. Attempt saved. Steven Naismith (Norwich City) right footed shot from the right side of the six yard box is saved in the top left corner. Assisted by Dieumerci Mbokani with a headed pass.